evPlanIt is a simple, easy-to-use facility for planning and managing Events such as weddings and business meetings. evPlanIt eliminates paper files, saves time and money, and avoids double bookings. You can quickly and efficiently schedule repetitive or recurring events. All event information is in one location and can be reviewed or revised by other evPlanIt or evDaily users. 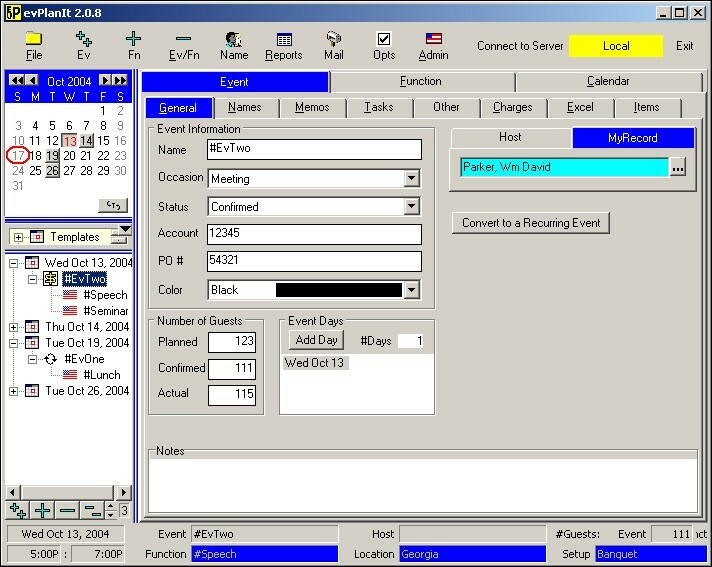 evPlanIt can operate standalone or can share Event information on the evServer with other evPlanit or evDaily users. An Event is a collection of management and financial information, including Event Name, type of Occasion, Status, Account, Purchase Order number, and number of guests. An Event can have one or more Functions on the same day or on several days. An Event can repeat daily, weekly, monthly, or annually. A Function describes when and where part of an Event occurs and can maintain information about room Layout, Food, Beverage, Equipment, Services, and Miscellaneous categories. Each line item can specify Cost, Profit, Price, Service cost, Tax, Price/Unit, Number of Units, and Total Price . The calendar at the top-left displays a button for each day in the current month that has at least one Event scheduled. The button for the current day is depressed. 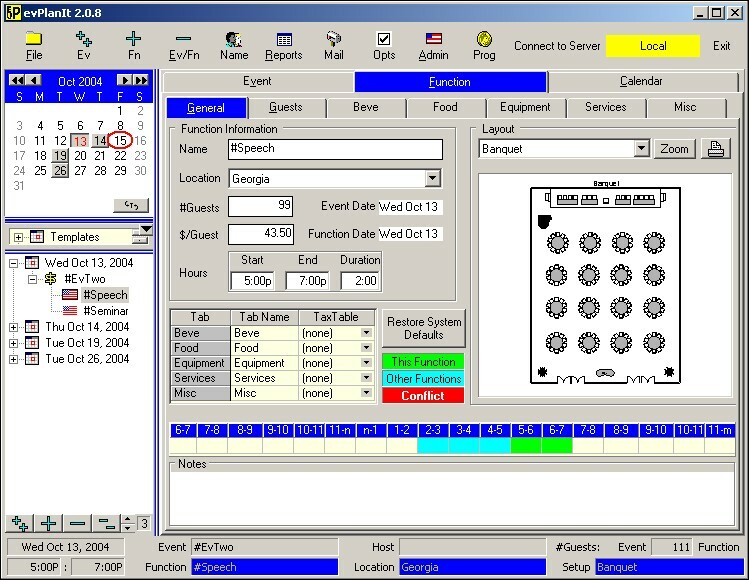 The outline at the bottom-left displays all Events and Functions. The left levels are the days for which an Event is scheduled. The second (center) levels are Events. The right levels are Functions. The Event | General tab displays general information about an Event. Click a tab to display information about Names, Memos, Tasks, Other items, Charges, Excel, or Items related to the Event. The Function | General tab displays general information about a Function. Click a tab to display information about Guests, Beverages, Food, Equipment, Services, or Miscellaneous information about the Function. The Food tab is typical of the information displayed about Beverages, Equipment, Services, and Miscellaneous items. The Tax Table is shown for the last item. Using this information, evPlanIt can calculate the Price (Cost + Cost * Markup%), Service, Tax, $/Unit, and Total Price.